With a glorious six year career at East Carolina University, I left with a Bachelor's Degree and a MBA. After a year skiing in Colorado, I started my career in Raleigh. My company offered me an opportunity in Tampa in 2002. 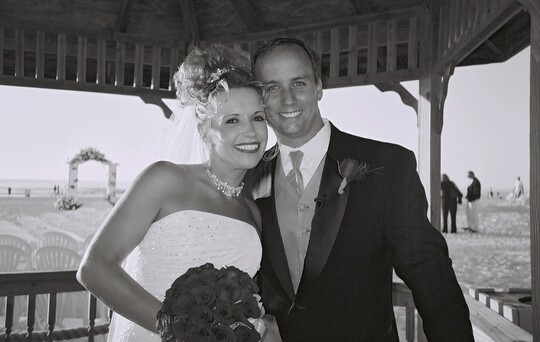 I met my wonderful wife Debbie in 2003 and we were married on Clearwater Beach in 2004...and have enjoyed fun in the sun ever since! It's still amazing how without the benefit of cell phones, within an hour, everyone knew exactly whose parents were out of town that weekend. That, and Erik Bell getting served in Camden buying cases of Eslinger. If that stuff didn't kill us, why worry about global warming! Michael Lundberg has a birthday today. Deb and me completing the Susan G Komen 3 Day 60 mile Breast Cancer Walk 2008 in St Petersburg. Deb and I are with the newest Lundberg, Onyx. We adopted her from a Lab rescue organization. While she is a full bred Labrador retriever, Onyx may well be the only retriever that refuses to retrieve anything (except treats)! Team Lundberg welcoming in 2009 across the street at our neighbors' home!